Carbon nanotubules are a few nm in diameter and many um long. intermediate between atomic and bulk behavior. Lysosomes/microbodies vary in size from 0.2 to 2 um. SET wire ~16nm, dot ~12. The ball-like animal viruses from Electron Micrographs of Animal Viruses. Shrunk by x2 to match animal viruses. Should redo screen w 72 dpi? the 3.16 Angstrom threshold down into order 10-10. Nanophase materials[link broken] have 1-100 nm grain sizes. 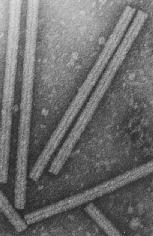 Retroviruses are 80 to 130 nm. 10nm diameter and about 20nm high. (Nature 98 Jan 28 p510). 2003-Feb-03  Repaired links - 3 fixed, 1 flagged, 1 left (bocklabs). 1997.Aug.19  Removed some viruses to speed loading.